Craftsman pedestals have a top plate that is cut out for a 3-1/2 inch square post; the hole can be easily enlarged in the field if your post is bigger. If we are making the columns for your order, we can cut whatever size hole you want at no additional charge. All of our pedestals are available with a solid top plate for use as a newel post. All Craftsman products are available in the wood of your choice on special order. We do not recommend the wood option for paint grade applications, the cost is higher and the PVC holds up better outside. Pedestals and newels are available plain or with these paneled options: standard raised panel, “square corner” raised panel, and recessed panel. (Since all tooling used for routing the panels is done with router bits, there will always be some radius in the corners. The “square corner” style uses the smallest bit possible to minimize that radius - about 1/8”.) Fluting is available as a custom option. Standard widths range from 8” to 30” in two-inch increments. Net widths of shafts are typically 3/8” less than nominal. Custom widths and heights may be requested in any size, typically from 2’ to 4’ tall and 48” wide. Custom plans, such as double-width for two columns, “L” shape for three columns on a corner, etc., are also possible. 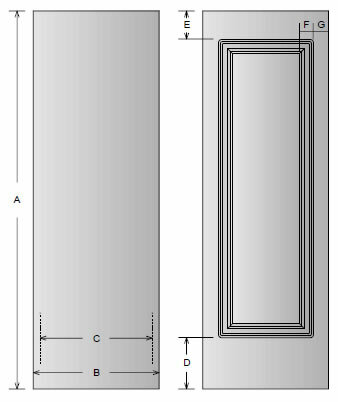 Pedestals are typically about 1/3 the height of the overall column, and the shaft width is about the same as the width of the base on the column which it supports. Pedestals and newels are often incorporated with rail systems, and Turncraft is able to adjust sizes, panel locations and heights, etc. to accommodate the attachment of railing components. 6" 5-5/8" 4-3/8" 4-3/4" 3-3/4"
8" 7-5/8" 6-3/8" 4-3/4" 3-3/4"
10" 9-5/8" 8-3/8" 4-3/4" 3-3/4"
12" 11-5/8" 10-3/8" 4-3/4" 3-3/4"
14" 13-5/8" 12-3/8" 5-1/4" 4-1/4"
16" 15-5/8" 14-3/8" 5-1/2" 4-1/2"
18" 17-5/8" 16-3/8" 5-3/4" 4-3/4"
20" 19-5/8" 18-3/8" 6" 5"
22" 21-5/8" 20-3/8" 6-1/4" 5-1/4"
24" 23-5/8" 22-3/8" 6-1/2" 5-1/2"
26" 25-5/8" 24-3/8" 6-3/4" 5-3/4"
28" 27-5/8" 26-3/8" 7" 6"
6" 5-5/8" 4-3/8" 4-3/4" 2-5/8"
8" 7-5/8" 6-3/8" 4-3/4" 2-5/8"
10" 9-5/8" 8-3/8" 4-3/4" 2-5/8"
12" 11-5/8" 10-3/8" 4-3/4" 2-5/8"
14" 13-5/8" 12-3/8" 5-1/4" 3-1/8"
16" 15-5/8" 14-3/8" 5-1/2" 3-3/8"
18" 17-5/8" 16-3/8" 5-3/4" 3-5/8"
20" 19-5/8" 18-3/8" 6" 3-7/8"
22" 21-5/8" 20-3/8" 6-1/4" 4-1/8"
24" 23-5/8" 22-3/8" 6-1/2" 4-3/8"
26" 25-5/8" 24-3/8" 6-3/4" 4-5/8"
28" 27-5/8" 26-3/8" 7" 4-7/8"
30" 29-5/8" 28-3/8" 7-1/4" 5-1/8"
6" 5-5/8" 4-3/8" 3/4" 1-1/4"
8" 7-5/8" 6-3/8" 1-1/4" 1-1/2"
10" 9-5/8" 8-3/8" 1-1/4" 1-1/2"
12" 11-5/8" 10-3/8" 1-1/4" 1-1/2"
14" 13-5/8" 12-3/8" 1-1/4" 2"
16" 15-5/8" 14-3/8" 1-1/4" 2-1/4"
18" 17-5/8" 16-3/8" 1-1/4" 2-1/2"
20" 19-5/8" 18-3/8" 1-1/4" 2-3/4"
22" 21-5/8" 20-3/8" 1-1/4" 3"
24" 23-5/8" 22-3/8" 1-1/4" 3-1/4"
26" 25-5/8" 24-3/8" 1-1/4" 3-1/2"
28" 27-5/8" 26-3/8" 1-1/4" 2-3/4"
30" 29-5/8" 28-3/8" 1-1/4" 4"